Brooke Sawyer is a successful record producer living in L.A. She has endured a lifetime’s worth of pain, but despite everything she’s been through, she still has the biggest heart. She’d do anything for the ones she loves, even putting their needs above her own. When she visits Paris for one month, the last thing she expects is to fall in love with gorgeous musician, Dylan Bissette. But he doesn’t know about Brooke’s life back home. He doesn’t know about Jamie. The best way to keep a secret is to pretend there isn’t one. Music connects them, but secrets may keep them apart. 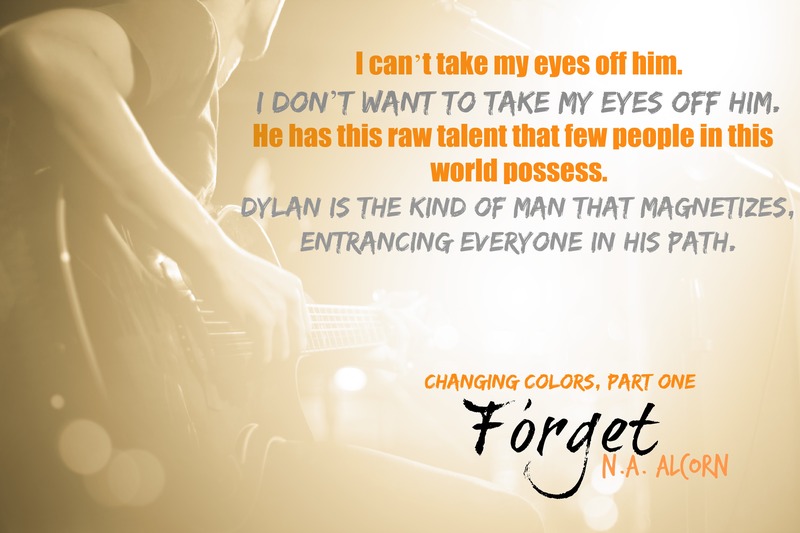 Forget by N. A. Alcorn tells the story of Brooke, an American visiting Paris, who meets and starts to fall heart first for Dylan, a half British half French swoon worthy musician. It follows these two as their serious sparks start to fly, and they find themselves having many more feelings than either of them planned for. I have to say that I loved every single phenomenally vibrant word of this book. I loved Brooke and how fantastically authentic and truly wonderful she was. I loved Dylan and was completely under his charming spell in about a nanosecond. I loved that I laughed hysterically more times than I could count. I loved all of the varied and thoughtfully crafted emotion and heat and vulnerability that weaved its way so superbly throughout this book. I loved how music played such an integral part to the plot, to these characters, and to all they experience. It was just phenomenal to experience from beginning to end, and I couldn’t get enough of Brooke and Dylan and their heart squeezing story. This author’s outstanding writing brought these two and their book world to life, and I for one cannot wait for the chance to spend more times with these utterly amazing characters. Brooke’s vulnerability. Brooke was such a fantastic character to get to know, and I loved that I got to know the “real” her over the course of this story. You see many sides to Brooke, the side she puts up to protect herself and then the side that is really her. 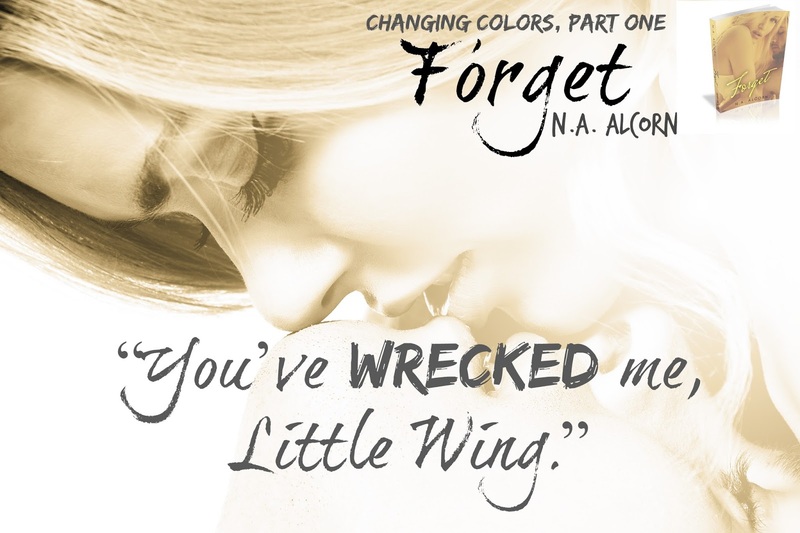 As you read Forget you will really get to know the real Brooke, aka Paris Brooke, and her vulnerability and rawness will just blow you away because of what it exemplifies about her. She is just so real, and the more you read the more you’ll understand why Brooke is the way she is. When you find out what this girl has gone through, and what she goes through in this book your heart will instantly go to her. Dylan’s bursting with charm. Now Dylan’s charming self practically stole my heart the instant he and Brooke meet. That man is sweet, and seriously stinking hot, and did I mention the fact that he’s a musician? The more you get to know Dylan’s character the more you’ll want to spend time with him just like Brooke because the pull and just magic that is him is irresistible. That man also feels so much, and I loved the instances in which I got into his head to really feel everything that he does. I am telling you now that there is no way that you can resist him, especially when you start to feel and experience what he shares with Brooke. A firework level connection and pull. Let me tell you that these two had an instant connection that this author phenomenally creates. You feel it the instant they meet and their connection just pulls you into them because of the sparks these two share. It is fiery, it is hot as all get out, and it just burns off the page in such a way that brings a certain kind of blush to your face. It also just makes you realize the power of what these two share together. The power of Millie. Now Millie just might be my favorite character in this book, behind Dylan and Brooke of course. I loved that lady and the wisdom and meaning that surrounded her. The words that she shared, the memories she evokes, and just the power that is her is just beautiful and so utterly meaningful. The power of Millie will just warm your heart. It’ll make you think and feel and wonder about the possibilities this world holds, and it’ll make you want to live your life the way that Millie did, with no regrets. Trust me on that one! The magic of Paris. N.A. Alcorn does an outstanding job of capturing the magical city of Paris. That city is almost like a third main character in this book, and I loved that I was fully encapsulated within the magic it evoked throughout this entire book. That magic just brought this book and these characters to life because I felt like I was right there with them feeling and experiencing that vibrant feel of the city with them, which was extraordinary to experience while reading. The questions that come up along the way. Now this book brings up a lot of questions, some of which are answered and some of which aren’t. (But stay tuned folks because there’s a book 2 that I cannot wait for!) I loved how those questions perfectly came up throughout what was happening with Brooke and Dylan. Those questions intrigued me and made me that much more enthralled with what I was reading because I couldn’t wait to figure out what was going to happen next, and if I was going to get an answer to one of those fantastic questions I had. Those questions pull you into this story heart first, and while you don’t get all the answers yet, you do get enough to realize that there is so much more to these characters than meets the eye, especially with Brooke, and that is utterly wonderful to experience. The honesty. Honesty plays an interesting and phenomenal role in Forget. There are so many raw and vulnerable moments from both of these characters where they are both so fantastically honest. Moments where they put it all out there on display for the other to see. Then there are moments where there’s not so much honesty, where you know there is more going on beneath the surface, and those moments are just as telling. Those moments surrounding honesty fit so magnificently into the story, and just illuminated so much about Brooke and Dylan. All the laughs a girl could ask for. Having read all of N.A. Alcorn’s other books, I was none too surprised to find myself laughing hysterically more often than not in this book. Through Brooke’s inner thoughts, her conversations with her best friend Lindsay, and through some seriously engaging moments with Dylan, I could not stop laughing at what was being said. That laughter broke up the tension and build in this book so fantastically, and it just made me love reading this book because of the laughs that it brought. More emotion than you can shake a stick at. This book had an outstanding level of varied emotion in it thanks to the phenomenal writing of this author. You get to feel every single thing these characters do, and even better you understand why they’re feeling it. The level of emotion in this book allows you feel Brooke and Dylan’s story on a whole new level. You hurt with them, you love with them, and you care with them. You feel everything with them and that makes this book all the more extraordinary to read. Brooke, Dylan, their lively, music filled, and superbly emotional story will have you feeling and thinking and caring like crazy. It’ll give you moments that’ll make you laugh, moments that will squeeze your heart because of what these two experience and go through, and moments that will break you and simultaneously send your heart to these characters because of what they go through. Forget will give you so much of everything that makes a book an extraordinary read. The way that N.A. Alcorn crafts this story allows you the outstanding opportunity to take it all in and to feel every word of it deep in your heart. When you reach that last page you will literally be counting down the days until you can become fully encapsulated within the magic and connection that emanates so beautifully from it. This story and Brooke and Dylan will engage you right from the start, and even in those moments in this book that kind of make you want to scream and possibly throw your Kindle clear across the room, you will be oh so happy at what those two and their extraordinary story give you as the reader. You’ll want to take in every beautiful, mesmerizing, heart squeezing, and lively moment Forget gives you, because what you get is nothing short of amazing.